Cretin Tracker 1.0: Keeps track of people you dislike. Just what the world needs. One tweak I did was to exclude the links reachable via the “POST” button, by adding to my ~/.plucker/exclusionlist.txt file the line 0:-:http:\//127\.0\.0\.1:5335/\?idStory=.*. 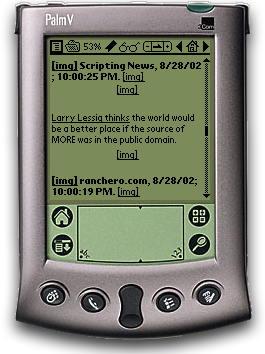 Plucker&apos;s Palm OS client is extremely featureful and has excellent usability. The only bizarreness I noticed was that the auto-scrolling feature defaulted to scrolling up rather than down, but it was easily fixed. Especially given Plucker is a free software project, I&apos;m very impressed. Versus AvantGo, Plucker&apos;s design is more sensible. The ability to do Web page fetching separately from uploading is great, as are the multiple separate databases, and support for local Web pages and automatically segmenting long files. The only feature I miss in AvantGo is support for tables; the bus schedules turn to mush when viewed in Plucker.